The TeacherToolsFastFile booklets by chapter are workbook activities that are leveled according to difficulty with answers provided. Audio Program includes the scripts and answers for the audio activities. The activities are recorded on the Audio Program CDs and are available online for download. A TPR Storytelling activity is included that matches the theme of each chapter, allowing you to implement TPRS in your classroom. 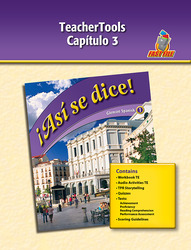 Quizzes are provided to assess the vocabulary and grammar taught in each chapter. Tests allow you to assess your students' achievement and proficiency in each of the skill areas. Tests are leveled according to difficulty. Scoring rubrics help you evaluate students' work.